It is needed when the blood or nerve supply of the tooth (known as the pulp) is infected through decay or injury. You may need one or more visits to complete the treatment, depending on root canals in your tooth. The exact procedure chosen by your dentist may differ from the procedure outlined here. Ask your dentist for further information. The procedure is usually performed using local anaesthetic. 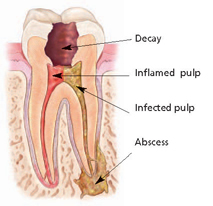 If the pulp is infected, anaesthesia may not always be necessary because the tooth no longer has any feeling. The affected tooth is wrapped in thin rubber (called a ‘rubber dam’) to prevent contamination of the root canals. The decayed portions of the tooth and any affected filling are removed. The pulp or pulp remnants are extracted. The dentist uses a special drill and small instruments to thoroughly clean and shape the root canals and to remove bacteria, pus and debris. The root canals may need to be shaped or hollowed out to ensure a smooth interior surface. The interior of the tooth is flushed with disinfectants and then dried. If the root canal is not infection free, it may be medicated and the tooth sealed with a temporary filling material. You may have to wait a few weeks, or even months, before the pulp canal is filled. If the dentist feels bacteria are still present at your next appointment, the cleaning procedure may be repeated and the tooth once again packed with medication. This stage will continue until the dentist feels the tooth is free from bacteria. The infection-free root canal is then sealed with long-lasting barrier materials (the root filling), usually a rubber-based material called ‘gutta-percha’. The tooth then undergoes restoration and the biting surfaces need protection – an artificial biting surface for the tooth is fashioned out of regular filling material. In many cases, where there is considerable loss of the tooth structure, there may be a need for an artificial crown made from porcelain or gold alloy or other materials. I had a severe promlem with TMJ which affected my life a lot, and can not thank Andrew enough for his help and assistance, I am now like a new man. Huge filling - Very good work done. I have a dentist phobia but they made me feel at ease!.